A lovely slice of Melbourne suburbia, Parkville is a green and leafy area with a pleasant atmosphere and lots of old charming colonial architecture. It is within easy reach of the heart of Melbourne, lying only 3 kilometres outside of the Central Business District. Good public transport makes it easy to get around. With several nice parks in the area perfect for relaxing and unwinding, you can really enjoy the outdoors. Planning a visit to Parkville? Check out our excellent Parkville accommodation and enjoy a fabulous stay with us. Parkville is home to one of Melbourne's major attractions – the Melbourne Zoo. Sitting in the lovely Royal Park, the zoo is home to a large number of unique animals. It is fascinating to see the different species playing, eating, and even sleeping! The zoo is a huge hit with people of all ages, but is especially loved by kids of all ages! Sports fans can see where the athlete's village was situated during the 2006 Commonwealth Games, and the nearby Royal Park Golf Course is perfect for a leisurely round or two. The University of Melbourne is located in Parkville, giving the area a great vibe and exciting energy. There are plenty of places to eat and drink, with a good diversity of cuisine on offer. The student population helps to keep prices relatively low, which is an added bonus for those on a budget. Enjoy a boat trip along the Yarra, visit the many galleries and museums of Melbourne, and see iconic sights such as Flinders Street Station, the Eureka Tower, Federation Square, the Old Melbourne Jail, the Parliament House, and the trendy Docklands. Make sure you check out Queen Victoria Market if you are on bargain hunt! Have a look at our flights to Melbourne – there are flights available from a large number of domestic airports, and the prices are sure to make you smile! We also have a wide selection of fantastic Parkville accommodation, perfect for business or pleasure. How Much is a Hotel Room in Parkville? 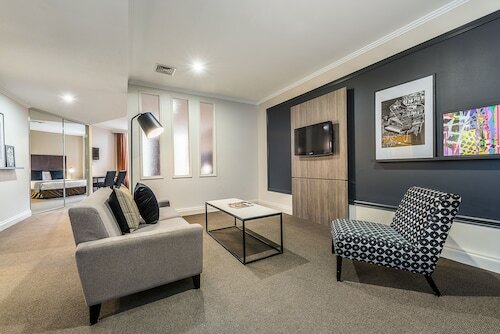 Hotels in Parkville start at AU$91 per night. Prices and availability subject to change. Additional terms may apply. The room was compact, comfortable, and clean. The staff were helpful and friendly, and the hotel was close to public transport...an easy walk to the station for my very early vline bus.